Philadelphia Energy Solutions and the Chamber of Commerce are championing a vision to ramp up Philadelphia as a fossil fuel energy hub to take advantage of oil and gas products from Pennsylvania and elsewhere. While this idea is being positioned as a win for our city, it could have disastrous side effects to our economy and environment. The fossil fuel hub vision includes ramping up production and export of natural gas liquids, expanding liquefied natural gas capacity, building new gas pipelines into the Philadelphia area, and building new natural-gas-fired power plants. The vision also includes attracting new petrochemical manufacturing to the area to use all of the new energy and processed materials. That energy hub infrastructure would increase harmful air pollution emitted in the Philadelphia area, exacerbate climate change impacts, harm the Delaware River Watershed, and hinder any chance our region has to benefit from a fast-paced transition away from fossil fuels and towards renewable types of energy and fuels. Our vision is to make the Philadelphia region into a renewable-energy hub, to improve air and water quality and spur the creation of well-paying jobs for Philadelphians by greatly increasing the city’s capacity to deploy energy-efficiency measures, solar energy, renewable fuels, and green infrastructure. This vision would not require importing harmful fuels such as oil, natural gas, and natural gas liquids. Displacing fossil fuel-produced energy with renewable forms of energy will promote good air quality and reduce premature death, lost workdays due to illness, and health care costs. Cutting air pollution is crucial for Philadelphia, where one in four children is diagnosed with asthma. Philadelphia received an “F” from the American Lung Association for smog pollution in 2014. The number of unhealthy air quality days is projected to increase by 70 percent in places like Philadelphia as a result of a warming climate. Philadelphia’s low-income populations are most affected by air pollution and extreme weather and are more likely to live near hazardous pollution sites. There is a lot already being done and a lot that can be done to realize the vision for Philadelphia as a renewable energy hub. This past year, Philadelphia City Council passed a resolution committing the city to promote solar energy. Policies like increasing local solar rebates and tying tax abatement for developers to energy efficiency and solar energy in buildings would help achieve City Council’s resolution. Additionally, Clean Air Council and the Sustainable Business Network are teaming up to encourage the rapid deployment of solar energy through a pilot solarization campaign in northwest Philadelphia. Through March, homeowners can use their collective buying power to get solar systems for their properties at greatly reduced costs with monthly loan payments that are less than their current utility bill. According to National Renewable Energy Laboratory data, the Philadelphia region has the potential to install 8,700 megawatts of rooftop solar — equal to about 25 percent of the region’s energy usage. Over 20 years, this equates to $1.3 billion annually in direct economic activity and $1.95 billion annually in indirect economic benefits for the Philadelphia area. Philadelphia could potentially get about 5 percent of this economic activity, or about $97.5 million, in the form of property, sales and wage taxes. By 2035, solar energy could annually provide more than 4,000 direct, well-paid jobs to local workers. Energy efficiency is also a key part of turning our city into a renewable energy hub. Efficiency like weatherization has immediate environmental, health and climate benefits, saves people money on electricity bills, and provides many local construction jobs. Jobs in energy efficiency can take advantage of the existing local workforce, and the work is much more job intensive than the natural gas industry. 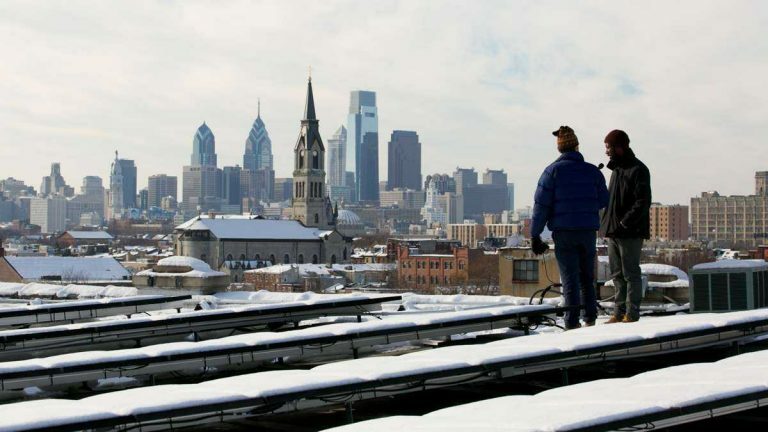 The American Council for an Energy-Efficient Economy completed a study in 2009 that found that with the right policies, installation of energy efficiency and solar measures could spur the growth of at least 9,000 jobs in Philadelphia by 2025. The fossil fuel energy hub concept would pollute our air and water for decades to come without the guarantee of long-term jobs for local workers. Creating additional pollutive fossil fuel infrastructure in Philadelphia is a risky economic investment because of environmental and safety issues, likely increases in natural gas prices, uncertain oil and gas reserves, and fierce public opposition. With the price of solar energy plummeting and the low-hanging fruit of energy efficiency, it makes a lot more sense to invest in creating a renewable energy hub for Philadelphia’s future. Matt Walker is the community outreach director for Clean Air Council. Jamie Gauthier is the executive director of the Sustainable Business Network of Greater Philadelphia.